Last week, Jon and I had the amazing opportunity to go to the East Coast Game Conference (ECGC) in Raleigh, North Carolina. We knew even before buying our tickets that we wanted to make the most of this opportunity. So we prepared two demos to show others at the conference; one for our VR Adventure Game called “The Island,” and one for our Game Development Accounting Software called “Level-UP”. Because of the nature of these two projects, and our own personal knowledge of the two, we decided that Jon would be responsible for The Island Demo, and I would be responsible for Level-UP. On the drive to Raleigh, we practiced our pitches for both projects, so that either one of us could talk about both projects, even if we were only responsible for one demo. I believe this worked out very well for us. We knew what our duties were, what we were talking about, and our goals for the week. My goals for Level-UP included talking to every small indie development studio that had a booth on “Indie Alley,” as well as anyone else I ran into that might be interested. I did pretty good, making sure to visit as many booths as I could, talking to studio owners, and showing them how I think Level-UP could really be an asset to their business tracking and bookkeeping. The results were astounding! Everyone I talked to was extremely impressed and excited for Level-UP. 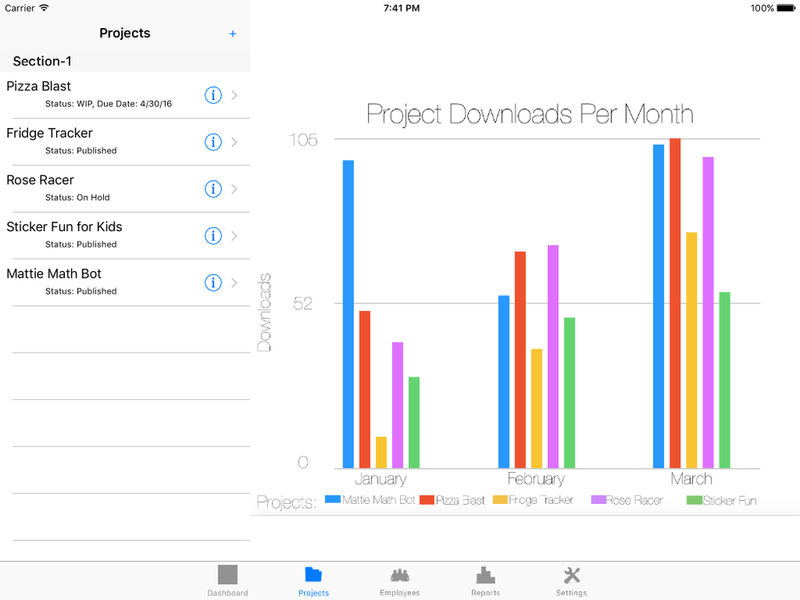 One person even described it as “Quickbooks for Indies”. Other comments included “It’s so simple and looks easy to use”, “I need this now! When can I get it?”, “Brilliant idea, there’s nothing else like this out there!”, and “I’ll be first in line to buy it!”. With such positive and exciting feedback, Jon and I know we definitely need to keep pushing towards our goals of having a Beta for Level-UP over the summer, and have the final version published in Early Fall of this year. This will be a challenge, but with hardly anyone having anything critical to say about the app, we know it is the right decision to push through and persevere!! With all this talk about how awesome Level-UP is, you are probably wondering what is it that everyone is so excited about? Well let me tell you….Level-UP is an app specifically made for game developers to help them keep track of their business and especially their financial matters. One thing that makes game developers, and especially indie game developers, different than any other industry is that to truly have accurate accounting, we need to look at our numbers on a “per project” basis. For example, Company ABC hires Joe Smith to do the art on their Project A. They arrange to pay him 10% royalties after the project has been published. A typical company would have to take the time (and remember to do so every month) to look up game sales information to calculate Joe’s paycheck, but with Level-UP, we take an approach that helps you eliminate those steps. 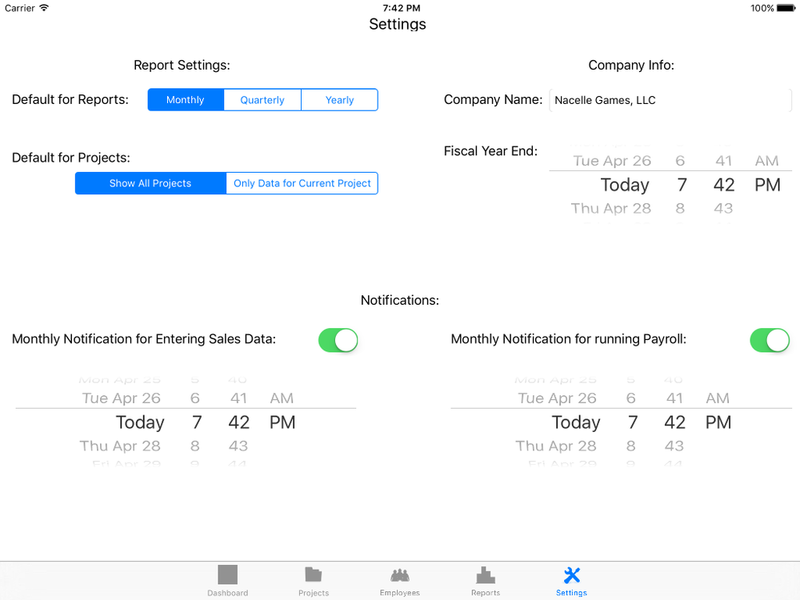 Level-UP will remind you once a month to enter your sales data (so you never miss entering data), and only one time do you need to enter Joe Smith, what project he is working on, and his pay rate for that project, into Level-UP. Once you have entered your sales data, we will calculate Joe Smith’s pay for you. All you will have to do is run a report (which we will remind you to run), and then pay him accordingly. The report will show you how much you owe Joe Smith, per project, and give you a breakdown of how the payment amount was calculated. So instead of taking the extra time to look up rates, look up sales, and calculate his pay, you just make sure the sales data is all entered and we calculate the pay for you! This makes it so easy for game developers who usually stay far far away from “bookkeeping” work! There are lots of options and details I have yet to mention about the app, but hopefully this example will give you a better idea of what Level-UP is all about!! Thank you to everyone that allowed me to share Level-UP with them at ECGC last week! Level-UP your Game Development Business!! There are so many details to keep track of when running your game studio, you need a dozen or more spreadsheets, or pay an accountant to keep track of everything. But not anymore! 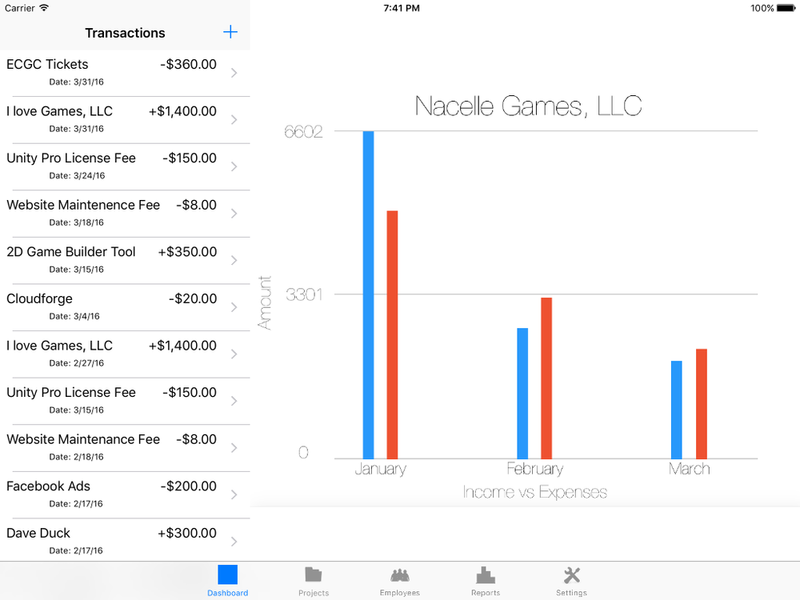 Today I am happy and excited to announce “Level-UP: Game Development Accounting Software” for iOS and OS X.